gallery gugging is a hotspot for the art brut scene. It has always been a place which artists, collectors and art lovers have visited to find inspiration; and promoting unknown artists is one of the gallery’s top priorities. gallery gugging was founded in 2009 under the name Gallery of the Gugging Artists Ltd. (Galerie der Künstler aus Gugging Betriebs GmbH.) The gallery primarily focuses on art brut, which has been defined by Jean Dubuffet as artwork by autodictats, characterised by its raw, natural form. We work closely with renowned galleries and museums across the globe. 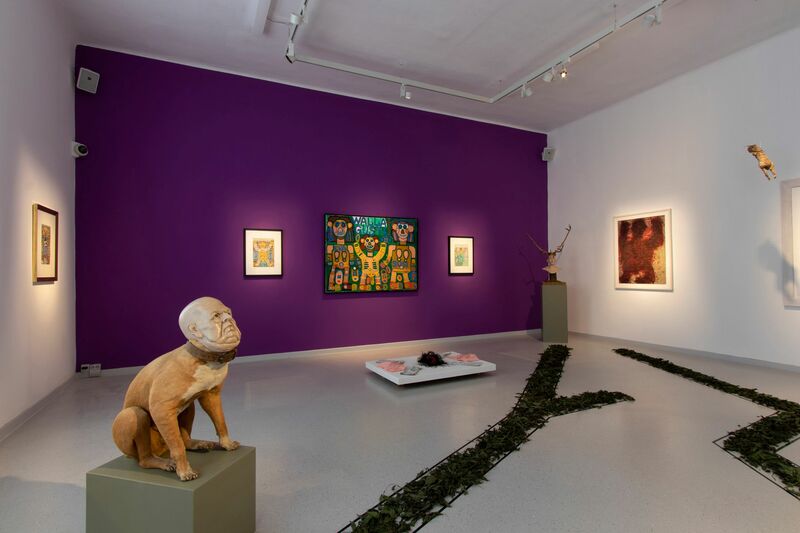 Alongside art created by the “Gugging Artists”, we exhibit works produced by internationally renowned art brut artists and their contemporaries whose work is similar in style. Four exhibitions per year take place at gallery gugging; they include a catalogue and an overview of the artists’ eclectic oeuvre, plus information about the latest events taking place at gugging. What’s more, the gallery has been represented at national and international fairs over the past few years, such as the Outsider Art Fair and the Independent Art Fair in New York, Drawing Now in Paris and SCOPE in Basel, as well as the Viennafair and Art Salzburg. Since May 2018, five works by the Gugging artist Leopold Strobl have been housed in New York’s MOMA collection, thanks to our co-operating partner, the Ricco/Maresca Gallery, having represented us at the New York Independent Art Fair. The “Gugging Artists” have always been a source of inspiration for brilliant musicians such as David Bowie, who decided to add their artwork to his collection and published his album “Outside” after visiting the House of Artists. We had a visit from the fashion designer Christopher Kane in summer 2016, and Heinrich Reisenbauer and Johann Korec’s artwork provided inspiration for his new fashion collection. The 2017 “gallery gugging special edition” expanded and intensified gallery gugging’s musical and artistic output. Surrounded by the Gugging Artists’ work, guest musicians and concert visitors are offered a unique artistic backdrop; successful world premières of performances composed specifically for this location, such as Christopher Chaplin’s “Paradise Lost” and Klaus Maria Brandauer’s reading of “Bowie”, have been met with success. gallery gugging enjoys a wonderful setting, right in the heart of the Vienna Woods. It is at once a place of tranquillity and of great creativity, which gives birth to new works of art and where artistic work is carried out on a daily basis. For us, gallery gugging is a “a balm for the soul”, where you can re-energise and not only take pleasure in art, but also meet and chat to the artists in their very own creative space.